This article has been compiled by disc jockeys throughout the country and is available at no charge through the Los Angeles Chapter of the American Disc Jockey Association. Sounds Like Fun Entertainment is happy to provide this planning resource piece for your convenience. Studies have shown that a big portion of the success of a wedding reception rests heavily on the shoulders of the disc jockey. While the common perception is that the DJ is there only to play music, today’s highly trained DJ professionals take on the role of event manager first and music programmer second. According to statistics published in St. Louis Bride & Groom Magazine in 2003, brides said that their highest priority during the planning phase of their reception was their attire, followed closely by the reception site and caterer. Reception entertainment was one of the lowest of their priorities. Yet, the day after the wedding 78 percent of those surveyed indicated that they would have made entertainment their highest priority if they had it to do over again. In a variety of surveys by such organizations as USA Today, the National Bridal Service and The Knot 81 percent of the guests indicated that they remembered the entertainment the most at a wedding reception. A wedding reception is a one-time live performance that requires the skillful experience of a master of ceremonies to manage. Like the Academy Awards, a reception should be a mixture of artful timing, rehearsed audience involvement and the live performance of the stars (that’s the bride, groom and their guests) for a complete success. Today’s DJ professional will carefully help plan the formalities of the event to the client’s satisfaction, then fulfill their wishes without the host having to worry about the details thereby allowing them to enjoy the day in the spotlight. An exceptional DJ will provide creative ways to navigate through each phase of the reception in a style envisioned by the bride and groom. While not a wedding coordinator, today’s premier disc jockey professionals do incorporate your wishes in a carefully orchestrated plan where they pace your reception for maximum success. Rather than just show-up and play music, the DJ takes the burden of timing and coordination off the bride’s shoulders allowing her to relax and enjoy the big day. There is nothing worse than finding out you made the wrong choice in DJs for your wedding when your inexperienced, low-priced DJ makes an inappropriate announcement and steals the focus away from the bride and groom. As part of the hiring process, couples should ensure that any DJ has the ability to work as part of a team to maximize the results from each professional. Since music is such an obvious part of a DJ’s role, the DJ should be able to provide a wide variety of appropriate music for through a premium sound system that incorporates a complete back-up solution for peace of mind. A DJ should also be completely insured for liability. A membership in a professional organization such as the American Disc Jockey Association also shows that your DJ respects his or her profession through national affiliations with professional organizations. Lastly, all the details of your reception should be provided in writing so there is absolute understanding by both yourself and your DJ professional. Like an experienced pilot, your DJ should have a written checklist to show you that they go through before your event so that there is no room for error. Several national organizations have suggested that the average price for a trained, professional DJ across the country is $1,200 for four hours of performance time. Those who seek above-average levels of service or a reception greater than four hours could expect to pay more. Since $1,200 is the average brides-to-be should remain cautious of those charging less than this – particularly if the price is well below this. 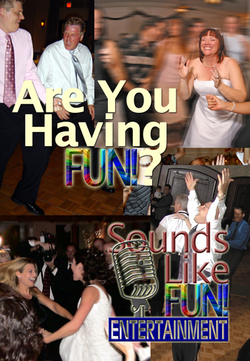 Shop carefully when choosing a professional disc jockey entertainer to be a part of your very special day. As one bride once said, you carefully choose from amongst your friends and family who will be part of your wedding day. You don’t want the person you like the least to be the one in charge of the microphone and sound system. 1 These statistics were published in St. Louis Bride & Groom Magazine in 2003. Sources include: Simmons, 2001; USA Today, 2002; National Bridal Service, 2001; The Knot, 2002; Brides Magazine, 2001.